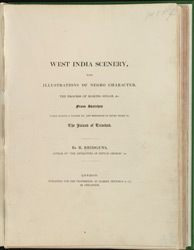 This is the title page of 'West India Scenery?' written and illustrated by Richard Bridgens, a civil engineer working in the Caribbean in the early 19th century, and published c.1836. It contains images of the landscape, architecture and various aspects of life on the island.